For many of us, whether you’re trying to escape the daily grind, wanting to spend more time with the kids, or craving to run your own business, finding a career that offers that elusive work-life balance can sometimes feel like a distant dream. Our premium, low cost, mobile franchise system specialises in delivering fresh, great tasting espresso coffee and food treats to office locations and events, where it hasn't been available before. Our dynamic business model typically runs on a Monday to Friday schedule, servicing workplaces within a chosen territory. 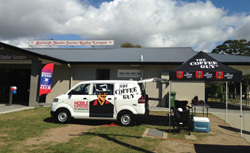 However, there is also the opportunity to work weekends at corporate events and functions. It really depends on how many hours you want to work and what suits your lifestyle. Rest assured, as a franchisee, you’ll have the flexibility and freedom to run your own successful business. Plus, you’ll also receive ongoing support from Australia's largest retail food brand manager and franchisor, Retail Food Group. 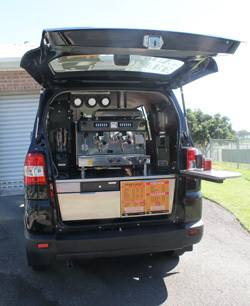 The innovative design of the TCG mobile coffee van gives you the chance to operate one of the simplest, most cost efficient and environmentally friendly small businesses available. 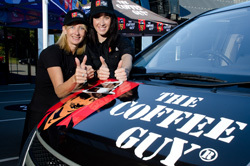 LPG gas technology to operate the espresso machine. A battery pack with enough juice to power a low eco fridge. A blender specifically for use with full cube ice. An on demand grinder for fresh coffee every time. Based on our extensive research, we strive to provide all our franchisees with enough business within their chosen territory. Our territory selection is based on the number of small to medium businesses in the area, the location of populated businesses and industrial centres, plus the density of the working population. This ensures you have a greater chance to make your business a success, and even add another van later down the track if you want to. One of our experienced staff will spend 2 full working weeks with you helping to develop your run, and your customer base. At the end of the two weeks you will have the skills to build on your business and be delivering outstanding coffee to a loyal customer base. we also give you additional in-store support when your store opens or upon settlement, in addition to ongoing assistance with in-store training on a needs basis from both National Office and the Sales and Performance team. Don’t miss the opportunity to achieve the lifestyle you want.